Corned beef and cabbage is tradition on St. Patrick's Day. 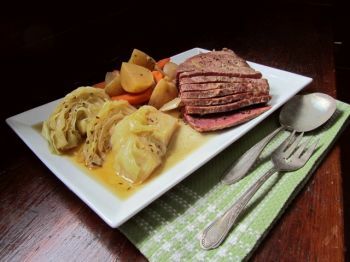 With St. Patrick's Day upon us, it’s an opportune time to share my tried and true recipe for corned beef and cabbage. Slow cooker haters be warned: it is made in the Crock-Pot. I am not exactly a fan of the Crock-Pot. I have a love/hate relationship with it: love the ease, but hate how textures can suffer and flavors often meld, and not into that happy marriage that mingles on your taste buds. Flavors meld into a pot of everything tastes the same. Corned beef seems to be the right type of meat for Crock-Pot cooking. It benefits from the low and slow process. Several hours of braising in flavorful broth produces tender servings of this cured meat. Most commercially available corned beef briskets come with a seasoning packet of pickling spices. Feel free to add it to the broth if you wish, but I don't. Worcestershire sauce, dry mustard and caraway seeds spice up the cooking liquid for me. The vegetables are where this recipe is a problem. It is the point where Crock-Pots fail. I have tried to prepare my corned beef without a layer of potatoes, carrots and onions in the bottom of the casserole, but these roots do add something to the flavor of the cooking liquid. It isn't the same without them, but I don't want to eat them. I like the pickled flavor of a corned beef brisket. I don't want everything on my plate to taste like it, though. The tender cabbage leaves don't need a super long cooking time, and when I finally add them to the simmering stock I often start prep for alternative side dishes. Mashed potatoes whipped with spinach and a bowl of buttered corn varies the textures and offers contrasting flavors. The potatoes, carrots and onions cooked with the corned beef make it to the serving platter, but not on my plate. Am I forsaking the luck of the Irish by not eating the slow-cooked potatoes? What’s your take on Crock-Pot cooking? Any tips to make every meal a pot of gold at the end of the rainbow? Trim the fat-cap from the brisket and (if necessary), cut to fit into crock pot. Arrange onion, carrots and potatoes in the bottom of the crock pot; place the brisket on top. Whisk together broth, Worcestershire sauce, dry mustard, and caraway seeds. Pour over the corned beef in the crock pot. Add the bay leaves and garlic cloves to the broth. I made corned beef for the first time this weekend, in my crock pot. I cheated a bit and did not add the veggies until the very end, as you did with the cabbage. I cook the corn beef in the crock pot and then cook the carrots, potatoes for 12 minutes on the stove with the water just barely covering them. The add the cabbage on top of the other vegetables, put a tight lid on and steam for 12 minutes. The cabbage comes out crisp tender and not slimy at all.